–Anthony Colucci, Rhode Island (catcher): A defensive stopper, Colucci also provided the offense a spark, going 2 for 3 and compiling an .800 on-base percentage. Colucci delivered key hits throughout Rhode Island’s road to the Little League World Series while also hitting a double, driving in a run and scoring a run at the Series. –Jarren Purify, Michigan (infield): Maybe the best overall player in the American field, Purify did something dazzling in each of the four games he played. Whether at the plate, on the bases or in the field, Purify was a human highlight film. The talented third baseman runs like an Olympic sprinter and hit .538 with a home run, double and five runs. Purify produced three multi-hit games and hit safely in all four. He crushed a mammoth home run against Georgia and twice helped Michigan overcome 4-0 deficits. Purify might have been even better defensively, making no errors. Purify made two of the best plays at the Series, twice robbing hitters of two-run doubles down the left-field line with brilliant diving stops. –Sean Yamaguchi, Hawaii (infield): One of the field’s best all-around players, Yamaguchi powered the U.S. Champion’s offense and also provided super defense at second base. Yamaguchi hit .417 and hit safely in three games en route to the world final. 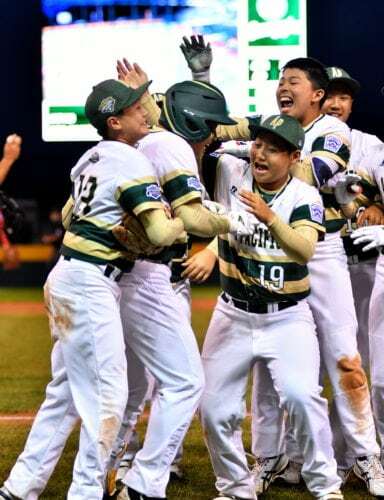 The hard-hitting 12-year old had a .562 on-base percentage and sparked a winner’s bracket final win against New York when he hit a mammoth grand slam. Yamaguchi drove in five runs, scored three times and also doubled. He also made no errors at second base and displayed a knack for turning potential hits into outs. -Tai Peete, Georgia (infield): An excellent all-around player, Peete did a little bit of everything to help Georgia finish second in the country and fourth in the world. A fundamentally-sound shortstop, Peete hit .409 in six games, going 9 for 22 and compiling a .519 on-base percentage. Peete belted three doubles, scored five runs and produced four multi-hit games. Peete consistently delivered timely hits and his two-out RBI double in the sixth inning against Texas helped Georgia overcome a three-run deficit. Peete also was outstanding on the mound, going 2-0 with a 2.00 ERA and 12 strikeouts in nine innings. –Maddox O’Connor, Iowa (infield): Whether in the field or at bat, O’Connor shined. A brilliant shortstop, O’Connor played near flawless baseball and made hit-saving plays in all three games. O’Connor was just as dangerous offensively, hitting a team-best .667. O’Connor had a .727 on-base percentage, went 6 for 9 and hit safely in all three games. O’Connor produced two multi-hit games, did not strike out, doubled and scored six runs. –Ryan Selvaggi, Texas (outfield): Talk about a player with a bright future. Selvaggi is a five-tool weapon who can play infield, outfield and who also is a dominant pitcher. Selvaggi runs like a deer and hit .500 with a home run, two triples and three RBIs. He also scored four runs and made no errors. Selvaggi’s speed is a big weapon and helped him hit two triples. Selvaggi was a force against Georgia going 4 for 4 and finishing a double shy of hitting for the cycle. –Tommy Turner, Rhode Island (outfield): His coaches described Turner as one of the best center fielder’s they have ever seen and he did not thing to weaken that reputation at the Series. Turner displayed excellent range in the outfield and possesses a big arm. Oh yeah, he is quite a hitter as well. Turner hit .500, going 5- for 10 with two doubles. He also was one of the Series top run producers despite playing in just three games, finishing with six RBIs. Turner scored five times, added strong pitching and was one of the team’s most valuable players all summer. –Hunter Nishina, Hawaii (outfield): Whether starting or coming off the bench, Nishina provided Hawaii a weapon and consistently sparked the U.S. Champions. Nishina hit .600 and totaled a U.S.-best .714 on-base percentage. Nishina hit safely in three of Hawaii’s first four games and reached base in all four. He also played strong defense in the outfield and was key to Hawaii winning close games against U.S runner-up Georgia. –Steven Martinez, New York (utility): One of the main reasons New York reached the Series, Martinez helped it finish third in the country and provided strong offense and defense. He was a tough out in the middle of the lineup, batting .500 and finishing with a .600 on-base percentage. Martinez hit two doubles and a triple while delivering hits in three of New York’s four games. Martinez also was a super shortstop all summer and made just one error in four Series games. –Aukai Kea, Hawaii (pitcher): What Kea did at the Series was simply remarkable. The hard-throwing right-hander put together one of the most dominant pitching performances one has and ever will see, going 2-0 with a 0.00 ERA. Kea overpowered three opponents, surrendering just six hits in 16 2/3 innings and striking out a world-best 31. Kea did all this against the country’s second and third-place finishers as well, never letting a Georgia runner move past second in an opening-round masterful performance. The bigger the games were the better Kea pitched as he earned wins in both the winner’s bracket and U.S. Finals. Kea put together a memorable performance against Georgia Saturday, throwing a 1-hit shutout and striking out 15 on just 82 pitches. He also hit .500 with a walk-off home run, two doubles and four RBIs. If one was to pick a U.S. MVP, Kea would be the winner. –Jansen Kenty, Georgia (pitcher): Everything Kea brings from the right side, Kenty provides from the left. A dominant pitcher who stifled two hard-hitting offenses, Kenty went 1-0 with a 1.59 ERA. He threw 5 1/3 shutout innings against U.S. Champion Hawaii, striking out 12 in that game that lasted 11 innings. Kenty threw a complete-game against U.S fourth-place finisher Michigan and struck out 21 in 11 1/3 innings at the Series. He also hit a dramatic, game-tying, 2-out, 2-run home run in the sixth inning against Texas as Georgia rallied from a three-run deficit and won, 7-6 in nine innings.